I’ve visited places where the locals say, “If you don’t like the weather, wait a few minutes.” In other words, if you can be a little bit patient, change is sure to come. I’ve been thinking about this concept of frequent change as it has a strong application to our lives right now. We are winding down toward Tennessee in a rather quick fashion hoping to meet the fall colors in the Smokey Mountains sometime in mid-October. Currently, we are in St. Louis, Missouri. The last two weeks have seen the bulk of our forward movement–every few days moving another few hundred miles. Making decisions about where we will park the RV while in-route has been interesting. While the Internet often has a wealth of information to offer, (spoiler alert) it’s not always accurate. 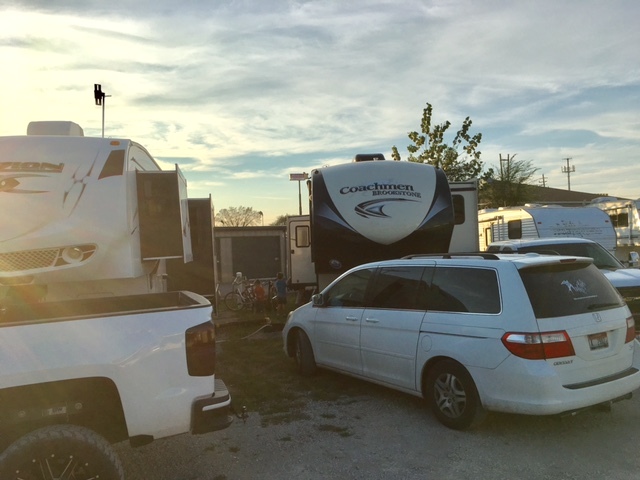 A few days ago we were parked in New Salem, IL as the only RV in a cul-de-sac type row surrounded by trees and quiet beauty. While we didn’t have an electric hookup, we were close enough to connect to water and the $10/night price was just right. Upon arriving to the St. Louis RV park we’d planned to stay in, we discovered that Google had neglected to mention that they were closed for the season. A quick internet search and a few phone calls later, we decided to stay at the only place we could find with full-hookups that wasn’t in the $50/night range. Plus the online reviews stated things like, “The new owners are really great” “So clean and peaceful. . . we will make this a yearly tradition” “Safe, clean and family friendly” and “Very clean and close to town” so we entered the address into our phones and off we went to Trail’s End. Now let me preface all that I am about to say with this: I am not an RV park snob. As long as we feel safe, I have no problem staying in ‘cheep’ establishments in order to save some money. 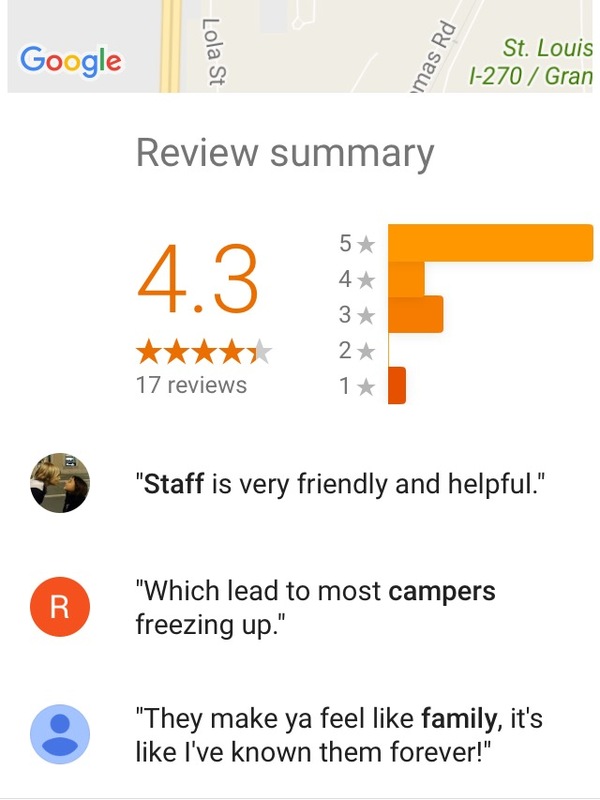 However, based on the nightly price and many 5 star reviews, I honestly had a different expectation set in my mind than what I saw when we pulled into Trail’s End RV park. “Oh my” is all that came out of my mouth. Someone was clearly tickling the online reviews for this place. Thankfully, my husband is becoming a master at backing into tight spaces because there was no room for error. I was hardly much help in directing him because the neighbor lady had my full attention. She was yelling and shouting at her kids and the closest nearby adults. I am pretty sure she was yelling at me at one point in which I simply responded, “I don’t work here.” Despite my husbands fantastic rear navigation, the sites are so short that there is hardly any room to park our car and truck without jutting out into the circular dive area of the park. This should be fine provided no one needs to drive by pulling anything long while needing to turn. . . Once we were situated, I began to open up the 5th wheel by extending the slideouts. At first we were a little concerned if we would have room to do this without hitting our truck which was wedged between our RV and the next one over, but all was fine. However, the weather was pretty warm so I decided to extend our awning to provide some shade. Oh, there’s the neighbor’s side right there. . . never mind about the awning. We also step carefully as we walk to our vehicles (which are parked conveniently close) as to not trip over our neighbor’s sewer hose. Tonight it became apparent that there was some sort of motor raceway located nearby as a sound like that of a swarm of bees swept over the campground ebbing and flowing throughout the evening. Trent and I keep exchanging looks and teasing comments. Its comical especially given the stark contrast to our little New Salem spot just a few nights ago. 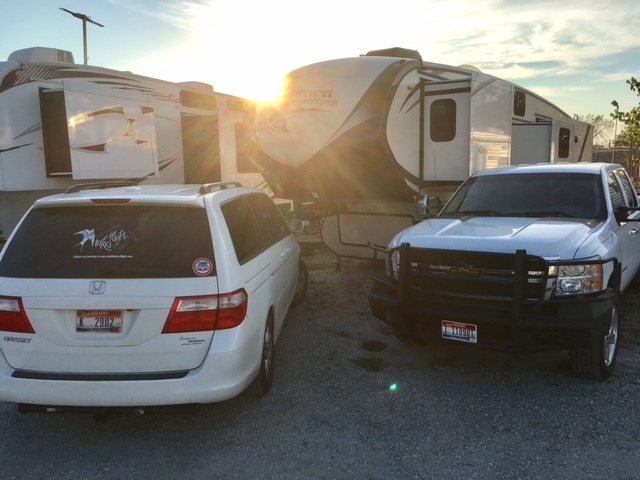 If there is one thing I have learned to count on while living in an RV it is that no two days are ever the same. Life around us is always introducing new experiences. 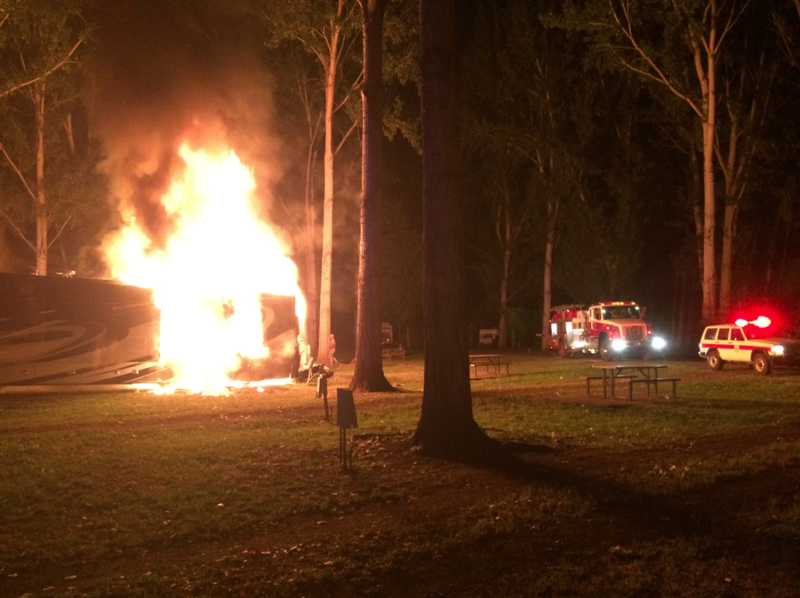 Last night it was a RV that caught on fire. Thankfully, it happened before the couple went to bed for the night. Thankfully, they (and their dog) got out safely. 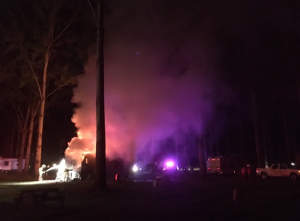 Thankfully, the fire didn’t spread to the neighboring RV (which got moved as soon as possible) or the nearby trees. Thankfully, we have a close and responsive fire department. 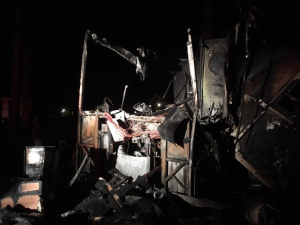 However, no number of thankful things can erase the fact that this was a devastating situation for the owners of the motor home. It is believed that there was some sort of electrical malfunction in the back of the diesel pushing rig. The owners were watching TV and felt a strange shaking almost like their dryer was running. Moments later there was a popping sound and a fire had started. They were able to escape with their little dog and the clothing on their backs. You can be sure we will be reviewing our fire safety routines after this sad situation.